The US government, which actively helps to starve the people of Yemen into submission, is concerned about Venezuela where so far no one has died of starvation? This lady ain't gonna believe that. The government of Venezuela does not reject aid that comes without political interference. Last year it accepted modest UN aid which consisted mostly of medical supplies from which Venezuela had been cut off due to US sanctions. 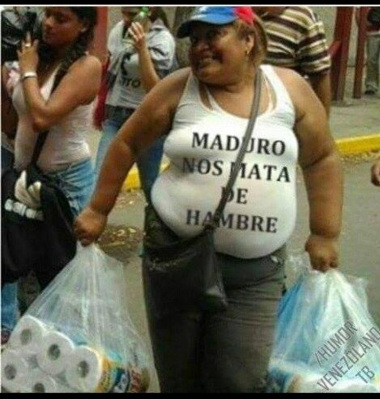 The UN claimed that around 12 percent of Venezuelans are undernourished. But such claims have been made for years while reports from Venezuela (vid) confirmed only some scarcity of specific products. There is no famine in Venezuela that would require immediate intervention. The US intent to establish a 'humanitarian aid' supply line into Venezuela has a secondary purpose. Such aid is the ideal cover for weapon supplies. In the 1980s designated 'humanitarian aid' flights for Nicaragua were filled with weapons. The orders for those flights were given by Elliot Abrams who is now Trump's special envoy for Venezuela. Where one such weapon transport is caught multiple are likely to go through. But to run a war against the government pure weapon supplies are not enough. The US will have to establish a continuous supply line for heavy and bulky ammunition. That is where 'humanitarian aid' convoys come in. Unless a large part of the Venezuelan military changes sides, any attempt to overthrow the Venezuelan government by force is likely doomed to fail. The US could use its full military might to destroy the Venezuelan army. But the US Senate is already quarreling about the potential use of US forces in Venezuela. The Democrats strongly reject that. US politicians are making the same mistakes with regards to Venezuela as they made with the regime change wars on Iraq and Syria. They believes that all people are as corrupt and nihilistic as they are. They believe that others will not fight for their own believes and their own style of life. They will again be proven wrong.